President-elect Donald Trump's motorcade shut down the Lincoln Tunnel in both directions at the outset of the evening rush Friday, backing up traffic for well over an hour as frustrated drivers vented over social media. Trump left his residence at Trump Tower in midtown late Friday afternoon, then hit I-495 to his golf course in New Jersey for the weekend. 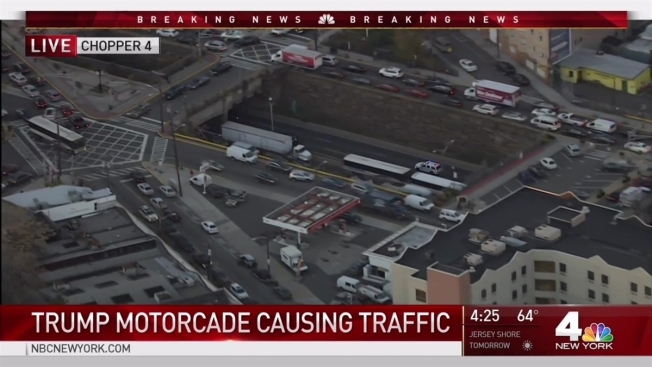 Chopper 4 over Lincoln Tunnel shows traffic at a standstill at Trump's motorcade zipped over the highway toward Bedminster. "@realDonaldTrump, thanks for closing down the Lincoln tunnel for your motorcade at 4pm on a Friday," tweeted one woman. Meanwhile, the NYPD and Mayor de Blasio are urging drivers to avoid the area around Trump Tower between now and Inauguration Day. "President Obama has come into New York City on a regular basis and there is a refined procedure. NYPD is well suited," he continued, though he recognized that "we never had a situation where a president of the United States would be here on a regular basis... but [Trump] will be here regularly." The mayor says the NYPD is "up to the challenge" and has an "excellent relationship with Secret Service" with a "clear set of shared goals."